Kumaraswamy had threatened to resign, asking the Congress to “control its MLAs” for criticising his style of working. 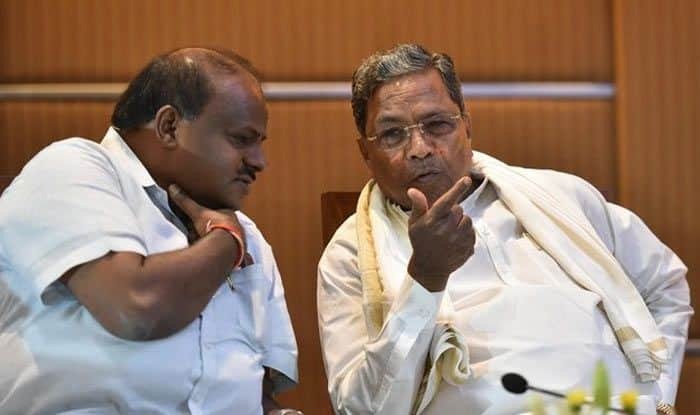 Bengaluru: The reported fissures between the coalition partners in the Karnataka government came out wide open on Sunday with Chief Minister H D Kumaraswamy threatening to step down, saying he never “craved” for power. However, soon after, the allies went into damage-control mode saying that they were united and there was no dispute at the leadership level. “There is no dispute in the coordination committee and the parties are united at the leadership level. The coalition between JD-S, Congress is a post-poll coalition, in which it is normal to have issues occasionally,” JD-S secretary general Kunwar Danish Ali told a news channel. He had spoken to Congress’ Karnataka in-charge K.C. Venugopal, who in turn spoke to the Chief Minister, Ali said. “Venugopal directed the Congress MLAs to fall in line. There is a good understanding between the parties, as the leaders want to deliver a stable coalition government for five years,” Ali added. Earlier in the day, Kumaraswamy had threatened to resign, asking the Congress to “control its MLAs” for criticising his style of working. The Chief Minister’s remarks came a day after two Congress ministers and a legislator on Sunday alleged here that no development works took place in the last seven-eight months under Kumaraswamy’s administration and claimed that former Congress Chief Minister Siddaramaiah was their leader and was a better administrator. Strongly reacting to the comments, Kumaraswamy said, “If my way of functioning is not acceptable, I am ready to resign. I don’t crave for position. “Our government has taken up projects worth Rs one lakh crore including suburban train, elevated corridor and peripheral ring road,” the chief minister told reporters after dedicating six-coach metro rail on ‘Green Line’ at the Mantri Square Metro Station. A red-faced Karnataka Congress president Dinesh Gundu Rao, who too was present there, said such statements by the Congress MLAs were not acceptable and a showcause notice would be issued to them. “Today Rs 8,000 crore worth work is happening. I condemn such public statements and will issue a showcause notice to them,” Rao told reporters. “If there are any shortcomings in our government, they should discuss straightaway with chief minister or Deputy chief minister G Parameshwara, who is in charge minister of Bengaluru… We cannot tolerate indiscipline,” he said. AICC general secretary and Karnataka in charge K V Venugopal said in a tweet, “Instructed Karnataka PCC to send a showcause notice to Somashekhar MLA seeking clarification on his controversial remarks. “If the explanation is not satisfactory, party will take strong disciplinary action. @INCIndia will not tolerate any such indiscipline statements and actions,” he said. Rubbishing the MLA’s demand, Siddaramaiah said the coalition government is for five years and there was no question of him becoming Chief Minister. “There is no question of my becoming chief minister again. This government is for five years,” Siddaramaiah said.